Make every job look Great! for unpainted PVC Trim only! PVC TRIMWELDERtm FAST CURE Adhesive is a rapid curing, two-component adhesive formulated and colored for PVC Trim Board applications with a work life of 4 - 7 minutes at 70º F after mixing. It is a creamy, medium viscosity, solvent-free structural adhesive that is EPA and CARB compliant. Cured performance shows excellent adhesion and bond strength. Adhesive joints are ready to handle in 10-30 minutes. 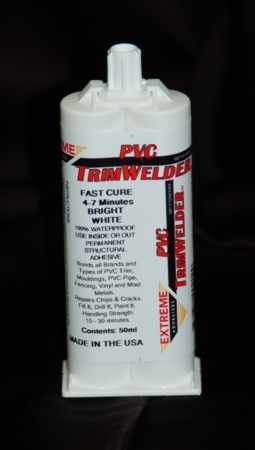 PVC TRIMWELDERtm FAST CURE Adhesive does not require special surface preparation. It’s stronger then PVC after curing and fills gaps to 1/8”. FAST CURE actually reinforces core to core joints without the need for fasteners or biscuits. The creamy consistency, won’t foam, run or drip and is well suited to seal and smooth cut edges for a finished look. Excellent sandability after curing. Why Should You Select This Adhesive? Packaged in convenient, easy to use cartridges.